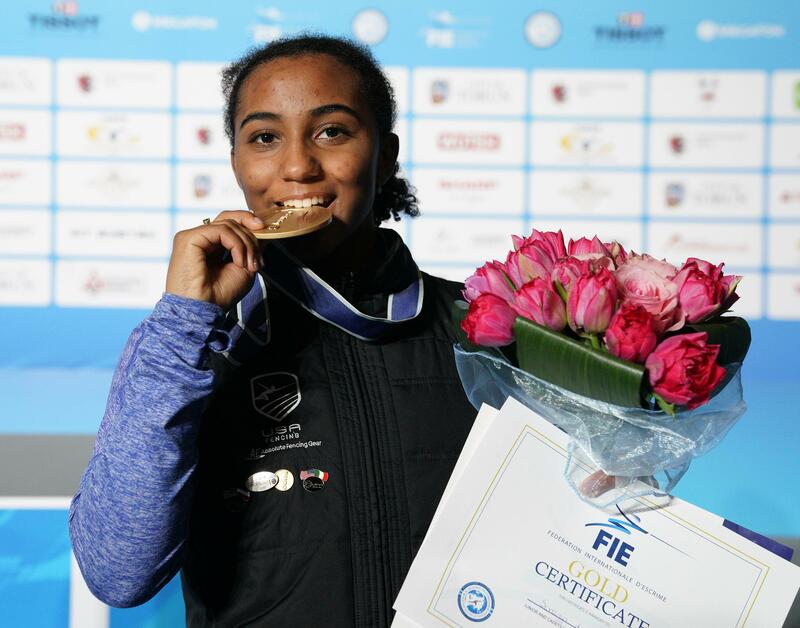 (Torun, Poland) – One by one, 16-year-old Lauren Scruggs (Ozone Park, N.Y.) defeated the best U20 fencers in the world to become the youngest U.S. foil fencer ever to win an individual Junior World title on Tuesday. Scruggs also continues a strong tradition in recent years with the Americans earning individual medals at the last nine Junior World Championships and gold in four of the last six editions of the event. She joins Prescod as one of only two African-Americans to earn a Junior World title in any weapon – male or female. “I’m just proud to represent America and be able to have younger fencers look up [to], especially because I’m a black female fencer. It’s something that I think younger fencers can look up to, so I’m proud to be a part of that family,” Scruggs said. The journey to the top of the podium wouldn’t be easy, however, as Scruggs would need to defeat three past Junior World medalists, including the No. 6 senior fencer in the world to win the title. After a 6-0 finish in pools, Scruggs entered the direct elimination rounds in a tie for the fifth seed with a difficult path ahead of her. Scruggs earned a bye into the table of 64 where she defeated Meriem Mebarki (ALG), 15-6, and she held Marta Caride (POR) to a tie at three after the first period of her table of 32 bout before pulling away with 11 straight touches in just over a minute to win the bout, 15-4. In the 16, Scruggs would use another run to pull away again. This time, Venezuelan Anabella Acurero Gonzalez (VEN) held a 5-4 lead after the first break and Scruggs responded with 11 unanswered touches to finish the bout with a 15-5 win in the third. Scruggs’ next opponent would be Leonie Ebert (GER) – the No. 6 senior women’s foil fencer in the world and a favorite to win the title in Poland after three senior podium finishes in the last 13 months. With the score tied at five at the break, Scruggs pulled away with an 8-6 lead before Ebert replied with a 3-1 run to tie the bout first at nine and then at 10 by the end of the second. Scruggs scored three touches in the first minute of the third period, moving ahead to a 14-11 lead and gave up just one more touch before securing a medal with a one-light hit for 15-12. Scruggs described the bout against Ebert as being one of the day’s most difficult, but said that keeping positive allowed her to pull through. “I just wanted to try my best, try not to give up. I always try to enter a bout, regardless of who I’m fencing, with a good attitude, a positive attitude, thinking not necessarily that I’m going to win but that I’m going to try my best and fence as well as I can,” she said. The semifinals would pit Scruggs against Yuka Ueno (JPN) – the reigning World Champion at both the Junior and Cadet level who defeated Scruggs in the quarter-finals of the 2018 Cadet Worlds. The bout got off to a conservative start with Scruggs holding a 3-2 lead after the first period and pulling away to 7-4 by the end of the second. Scruggs scored once more before Ueno tied the bout at eight. Scruggs took two touches scored twice more, but Ueno tied the bout at 10 in the final minute to send the bout to a sudden-death overtime minute. Scruggs drew priority, but wouldn’t need it, scoring the first touch two seconds into the bout to win the bout, 11-10. In the finals, Scruggs took on Martina Favaretto (ITA) – a silver medalist at the 2018 Junior Worlds and bronze medalist in last year’s cadet event. While Favaretto won their last bout in the 2018 Junior World semis, Scruggs took a 12-6 lead, dominating the opening period before the Italian rebounded to cut the lead to 13-10. Favaretto came within one of Scruggs at 14-13, but Scruggs closed the bout at 15-13 to win gold. With the cadet (U17) and team competitions scheduled over the next two days, Scruggs will have less than 12 hours to regroup before she has to return to competition with another World title on the line. She plans on taking the day, as always, bout by bout with the goal of returning to the podium. Scruggs’ teammate, 17-year-old May Tieu (Belle Mead, N.J.), earned a top-16 finish in Torun, placing ninth after winning silver at the 2018 Cadet Worlds. Tieu went 6-0 in pools to earn the No. 3 seed in in the direct elimination rounds where she controlled her bouts against Anna Poltz (ROU) and Rebeca Candescu (ROU) for 15-6 and 15-8 wins, respectively. In the table of 16, however, Marta Ricci (ITA) took the win, 15-11. Former Cadet World medalists Sylvie Binder (Armonk, N.Y.) and Delphine DeVore (Westport, Conn.) each entered the event looking for a first-time individual Junior World medal after winning gold in team last year with Scruggs and Tieu. A Columbia sophomore who won NCAAs two weeks ago, Binder was ranked as high as No. 2 in the world this season and finished tied for first out of pools at 6-0 with a +26 indicator, but lost to Magdalena Lawska (POL), 15-14. Eighteen-year-old DeVore went 5-1 before a 15-11 loss to Mengqing Zheng (CHN). In the men’s event, 18-year-old Marcello Olivares (Cooper City, Fla.) earned the top finish for the Americans, placing sixth and upsetting 2018 Junior World Champion Nick Itkin (Los Angeles, Calif.) in the 32. Olivares finished the pool rounds at 5-1 and soundly defeated Janko Leskovac (CRO), 15-4, to advance to the 64 where he went on a 7-1 run to open his bout against Tyvan Bibard (FRA) and finished with a 15-5 victory. Itkin, a Notre Dame sophomore fresh off his second NCAA title, ended the pools with a 6-0 record and defeated Roey Eliyahu Rosenfeld (ISR), 15-10, and Raz Goren (ISR), 15-7, to advance to the table of 32 against Olivares. Itkin led the bout at 3-0, but Olivares tied the score at four and went on a 6-2 run to take a 10-6 lead. Ikin countered with a trio of touches to cut the lead to 10-9. In the second period, however, Olivares controlled the bout with four straight touches. Itkin picked up two more before Olivares closed at 15-11. In the 16, Daniel Giacon (NED) led the bout, 4-2, but Olivares regrouped, going on a tear, scoring eight to take a 10-4 lead and finished the bout with a 5-3 run to end the bout with a 15-7 win. With a medal on the line, Olivares fenced Kirill Borodachev (RUS) in the next round. Aiming for a second individual Junior World title, the Russian took a 9-1 lead in the first period before Olivares regrouped to end the period at 10-5. Olivares scored five in the next period, but Borodachev finished the match a 15-10 victory en route to winning gold. Two of Itkin’s teammates on the squad that won bronze at the 2018 Junior Worlds – Kenji Bravo (San Francisco, Calif.) and Harvard sophomore Geoffrey Tourette (Cupertino, Calif.) – earned top 64 finishes. Bravo earned a bye into the 64 after a 6-0 pool finish, but lost his first direct elimination bout to Luis Klein (GER), 15-10. Tourette, who also went undefeated in pools, won his table of 128 bout against Mathieu Nijs (BEL), 15-9, but lost to Lok Wang Lawrence Ng (HKG), 15-8, in the 64.